STRANDS Hair Color Founder and CEO Mirela Marinescu describes her company’s new permanent cream color system as, “a high-end boutique hair color collection that consistently delivers high-end results”. Having discovered the original established color technology in Italy, Mirela directed her lab resources there to adapt and create a permanent color collection exclusively for the American colorist and client. A few years later, and to Mirela’s critical standards, the beautiful results emerged: The STRANDS Hair Color Collection with Argan Oil and Keratin, featuring REFLEXIONS™ (low ammonia) and COLOR LUST (ammonia-free formula). 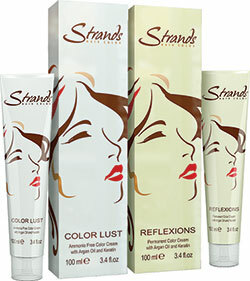 STRANDS, with Argan Oil and Keratin features two permanent cream color lines in tubes. There’s REFLEXIONS™ Permanent Low-Ammonia offering 33 shades and COLOR LUST™, an Ammonia-Free formula with 27 shades available. Both offer rich, vibrant color, superb condition and incredible shine (with pure micro pigments) plus lasting coverage. The STRANDS Hair Collection is the only professional color line exclusively offering Argan Oil, which nourishes, hydrates, and improves elasticity. Keratin is responsible for rebuilding and strengthening the hair fiber, while STRANDS unique Pure Micro Pigments ‘polish’ as they go into instant action to ensure rich, shining color that lasts for your clients. Envision each shade drenching every individual hair strand with shine-enhancing, moisture-rich conditioning. Blondes glisten … redheads radiate … and brunettes reflect a brilliant sheen.